When you first enter the museum, you come into our Blue Room. 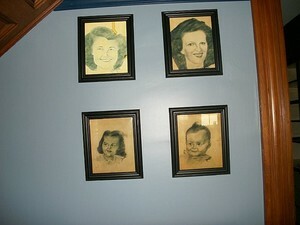 You will also see our “family” who built the house. This is the Seymour Reed family who built our home December 1891. 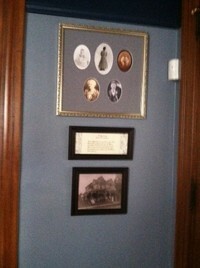 This is the Seymour Reed family who built our home December 1891. 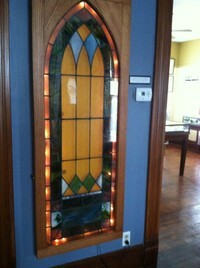 You will also find one of the first stained glass windows that was in Oakfield. It came from the First Presbyterian Church. When the church disbanned the Presbytery took over the property and they were going to auction off the window. Norm and Carol Rogers were able to get the church window for us. The drawings on the wall were done by a German soldier who was captured and held as a POW here in Oakfield. His name was Gerhardt Malachowski born 12/27/26. He was a soldier in the 147th Art. Regt, 47th Infantry Division.He and the other German prisoner’s that came to Oakfield were here to help at the Haxton Canning Factory. We also had Italian POW’s they were kept seperate from the German’s up on Maple Avenue. The Italian POW’s were allowed to go to homes of Italian families on Sundays for a few hours. It was not unusual to see the German’s marching up and down Maple Avenue for exercise. The drawings were made in November 1944. 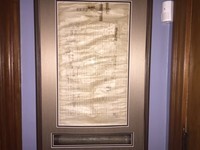 One addition to this room is a map from 1858 that was donated to us from Mr. & Mrs. William Adams it was found in the wall of his childhood home on Webber Avenue in the 1950’s. 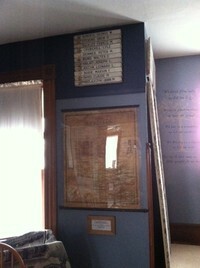 We also have the name boards of all the WWII veterans on permanent display. This was part of a sign that originally sat in Triangle Park. Some of the boards have a gold star representing the men who died in service. 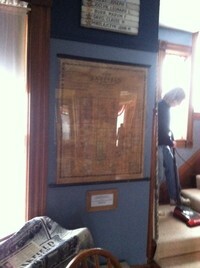 The Town of Oakfield recently had the original Cary Cemetery map framed and given to us as a gift.